If you're trying to make organic foods a way of life in your home, you may be interested in finding great USDA organic dog treats to make that a reality. Thankfully, what you'll discover is that finding organic dog treats for your family pet is really not as difficult as you may think. There are very few dog treat manufacturers who both serve a national market and produce 100% USDA-certified organic treats. However, there are a great many that produce treats that are 95% USDA certified organic or higher. Grandma Lucy's has been around since 1999, and is known as one of the few nationally-available brands of 100% organic dog treats. All of their organic dog treats bear the USDA certification seal and are verified to be 100% organic. Their line of 100% organic dog treats are not meat-based treats, but rather are based on various fruits and root vegetables. Grandma Lucy's goes out of its way to be accessible to customers. The company started when the owners' dog Lucy gained food allergies and wasn't able to eat any old dog treat anymore. Their quest to develop treats that their beloved family dog could eat was the impetus behind the creation of the company, and is the guiding force behind all their foods. 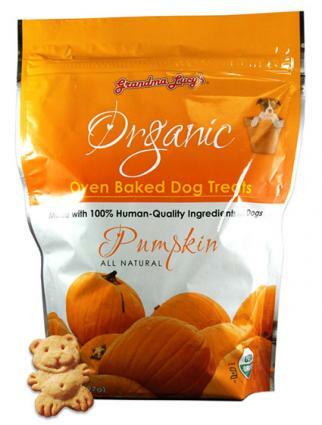 The organic dog treats are even kosher and made with human-grade ingredients. The company's reputation is a solid one, with high ratings on most dog food review sites. Independent review organization Dog Food Advisor gives Grandma Lucy's dog food a 4 star rating, which is the second highest rating it gives. On popular pet food shopping sites like Chewy.com, Grandma Lucy's foods and treats earn either four or five star rankings from customers consistently. Plato Pet Treats offers a huge range of organic and natural pet food options. 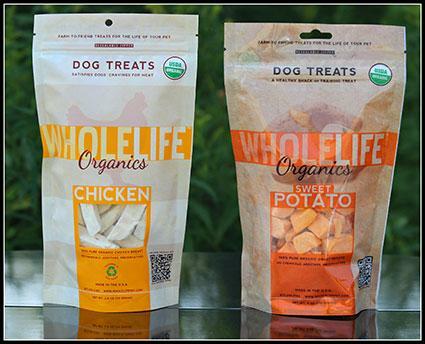 Among these options is their line of USDA certified organic dog treats. They create their dog foods with the idea that all dogs are naturally omnivores, just like their wild canine ancestors. As such, they bring a lot of veggies into their food mixes, but always with a healthy dose of meat. Not all of their foods and treats are organic, but they do provide organic options. 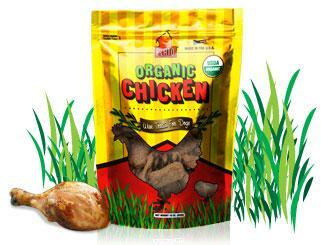 Plato's Organic Chicken Treats are made from USDA organic chicken and all natural ingredients. There are no preservatives, no unnatural flavors, and no GMOs in Plato organic treats. Moreover, the treats at Plato Pet Treats are fortified with essential canine nutrients to help promote better health. Plato Pet Treats are sold on many national organic pet food sites. This includes OnlyNaturalPet.com, where Plato Pet Treats enjoys a very good reputation for quality and customer service. Whole Life Pet Products is another pet food manufacturer that produces 100% USDA certified organic pet treats. According to the company, the mission of Whole Life Pet Products is to produce the highest-quality pet products that don't have to compromise on flavor. They freeze-dry their pet treats instead of canning them, freezing them, or using some other preservation method. This allows them to preserve their foods without having to add preservatives or use lower quality ingredients with higher shelf lives. The Just One chicken breast treats are a great example of Whole Life's approach to dog treats. The chicken used for these treats is 100% certified USDA organic, and is 87% minimum crude protein. Since these treats are essentially nothing more than freeze-dried organic chicken breast strips, they are a "what you see is what you get" kind of treat. Since the chicken is organic, it was raised without the use of antibiotics or other harmful chemicals and you can be sure your dog will be healthy eating these treats. Whole Life Pet Products enjoys good reviews on many independent pet food review sites, including Dog Food Advisor and others. Customers say the food is great, and it's nice that the food is easily accessible at larger stores like Walmart. 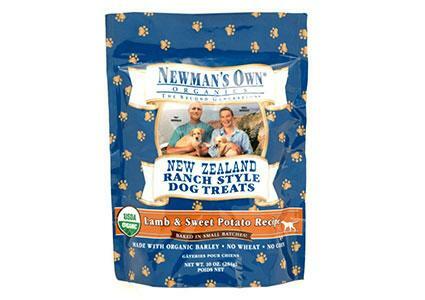 Treats like Newman's Own and Whole Life can be found at many larger retailers around the US, and are not difficult to find. Others are a little harder to find, and you may have to order online to get your hands on them. However, finding organic dog treats is much easier now than it once was. Give your canine companion a treat you can feel good about while also satisfying your dog's love of tasty treats.